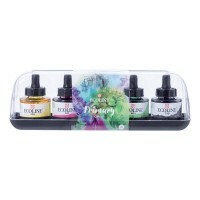 Watercolour Inks are a concentrated liquid watercolour paint. They are usually available in glass or plastic bottles, and commonly feature a pipette in the lid that will help you carefully calculate your colour mixes. Watercolour Inks are fluid enough to be used straight from the bottle, however, they can be further thinned with water if necessary. They can be used with traditional tube or pan watercolour paints to create exciting watercolour paintings and illustrations. 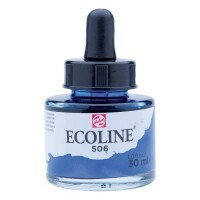 Ecoline Liquid Watercolour Inks are transparent and dye-based and can be used just like regular watercolours to create washes and detailed illustrations. Available in 30ml bottles. This set comtains 5 x 30ml bottles of Ecoline Liquitd Watercolour Ink in a selection of Primary Colours; Lemon Yellow, Magenta, Sky Blue (Cyan), Green and Black. 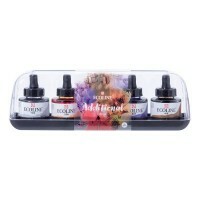 This set comtains 5 x 30ml bottles of Ecoline Liquitd Watercolour Ink in a selection of additional colours. Colours included are: Grey, Light Orange, Ultraviolet, Sepia and Vermilion. 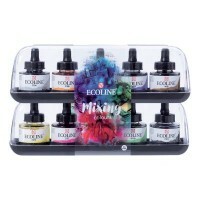 This set comtains 10 x 30ml bottles of Ecoline Liquid Watercolour Ink in a selection of colours.